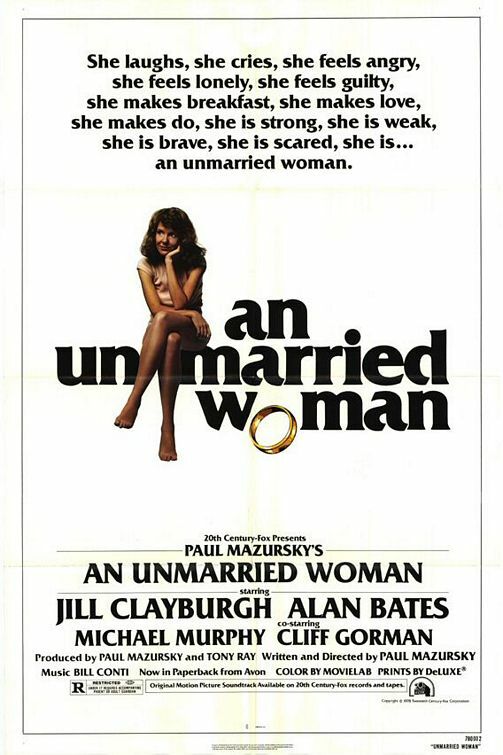 Oscar Movie: "An Unmarried Woman"
After her husband of 16 years leaves her for a younger woman, Erica (Jill Clayburgh) is forced to deal with the repercussions and emotions that divorce brings. She must find and make a new identity for herself involving her new-found sexual freedom and all that it encompasses. In 1978, we're sure this movie made an impact on people everywhere because of the subjects it dealt with: divorce, sexual freedom, and women's liberation. In 2013, this movie doesn't make quite the same impact, unfortunately. Though this movie does deliver a message, the goal of movies in and of themselves is to keep audiences entertained, to tell a story effectively to keep them reigned in and interested. This movie is slowly paced and drags on and on, leaving us a bit bored. It has its moments, and Jill Clayburgh does well in this film, but not even her performance can save this lackluster story. Do we recommend this movie: IfMeh.